The following is a guest blog post by current active Slow Food Chicago board member Naaman Gambill (education chair), recounting his experience as a S.O.A. CTE Teacher of Agriculture and Horticulture at CPS' Southside Occupational Academy. Naaman is also the managing partner and head beekeeper at The Hive: Chicago's Beekeeeping Supply Store in North Lawndale. On the Southside of Chicago, a train rumbles across old tracks in West Englewood, as a large onyx rooster bellows out his crow, challenging any whom might oppose him. The size of this rooster is startling. Weighing over 10 pounds, this Goliath of the chicken coop could easily be mistaken as a tough old bird that has seen many Chicago winters come and go, but in actuality this will be its first; this rooster is less than 8 months old. New Jersey Giants, are a heritage breed that came into existence in the 1880s by brothers, John and Thomas Black of Burlington, New Jersey. The brothers were looking to replace the expensive turkeys with an affordable big chicken alternative for American families. However, the long-term development of up to 9 months before market ready, made the economics of raising this bird disagreeable to most farmers. Even though this bird is an excellent dual purpose bird (used for both eggs and meat) that does well even in cold climates, it has been placed on the Livestock Conservancy’s “Watch List” do to their lack of numbers. It has also been included as an Ark of Taste breed by Slow Food USA. 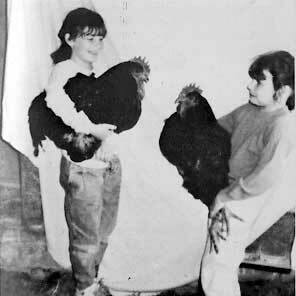 Jersey Giant Chickens on the Ark of Taste. Photo from slowfoodusa.org. Each day, the students of Southside Occupational Academy High School’s, Agriculture class take care of a flock of 24 of these chickens (along with 21 ducks). Split into two groups, one gathering eggs and checking the coop and the other feeding and refilling their fresh water in the run. The students take great care of the animals, checking that the birds are in good health, and carefully collecting the eggs. Each day the students collect over a dozen mocha brown eggs that the Jersey Giant hens have laid. Carefully they place the eggs in a basket and bring them back into their Agriculture classroom to clean, sanitize, sort and label the eggs. These “farm fresh” eggs will then be sold to the staff to take home and the proceeds will go back to the Agricultural program. This commitment to self-advocating and respect for others and the environment feeds into the success of all of the programs that these students endeavor. It also resonates most succinctly in their Agriculture program. As an often overlooked and marginalized feathered friend is finding support in a demographic that can truly empathize its plight. Want to know more about the Ark of Taste? You can view the living catalog here. Want to learn more about this agricultural approach at Southside Occupational? Get in touch with Naaaman at naaman@slowfoodchicago.org. The following is a guest blog post by Slow Food Midwest Ark of Taste Committee Chair Jennifer Breckner. You may have caught some of her photos from her travels on our instagram on Thursday 11/2/17 over at @slowfoodchicago. For a more in-depth behind the scenes look at her trip to Chengdu, China for this year's Slow Food International Congress, read on! Thank you, Jennifer for sharing your journey with us! Every five years, Slow Food holds an International Congress which allows delegates to gather around issues that will guide the organization forward. It’s a point to pause and take stock of our past work but also to delve into areas that we could be better at—think inclusion, openness and diversity—and then set a vision for the work we have ahead of us. In addition, Slow Food, as a nonprofit, is required to share information such as financial statements, and to produce reports on their work such as the 2012-2017 Ark of Taste Document, as well as allow delegates voting rights on statutes that the executive committee has deemed important. These are procedural things that happen at these gatherings. 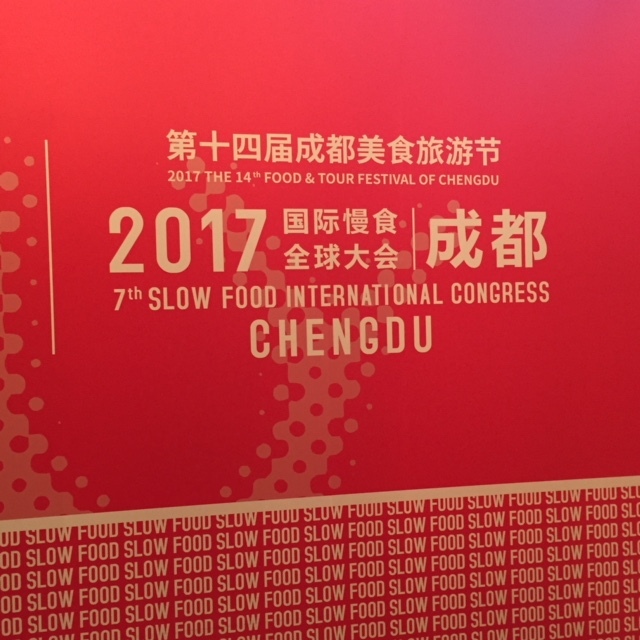 The 7th Slow Food International Congress took place in Chengdu, China, from September 29 – October 1, 2017. Over four-hundred delegates traveled from ninety countries to attend, including forty-three from the United States. Chengdu is located in the Sichuan Province. 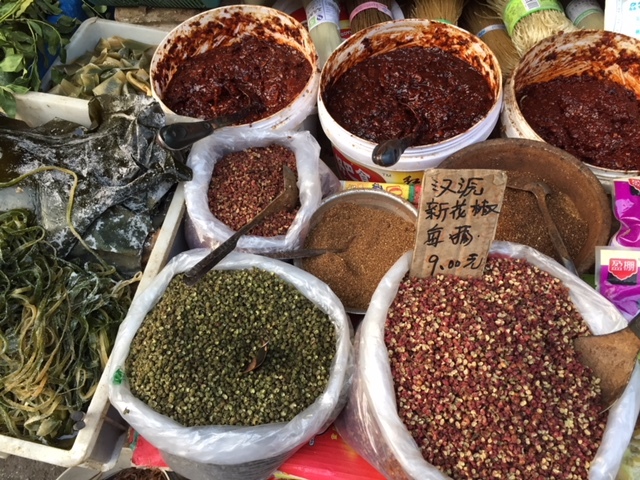 It was designated a UNESCO gastronomic heritage site in 2010 and has more than sixty thousand restaurants providing complex, flavorful and absolutely phenomenal food and is known for Sichuan peppercorns, which add a dose of tingle to your tongue. Spices displayed at the farmers market. The conference was held at the Shangri-La Hotel and we were welcomed at a traditional Sichuan dinner on Thursday night at a tea house. The full conference began very early the next morning as, ahem, some of us were dealing with jet lag and were very grateful that the Italians brought coffee from Lavazza. Kicking off the first day of formal speeches was a parade featuring representatives from each of the countries in attendance proudly waving their flags. It’s a gesture that highlights the global connections of our Slow Food network and adds a bit of fun to the event. Kathryn Lynch Underwood from Detroit, Tiffany Nurrenbern from San Francisco and I attended as newly elected International Councilors representing the United States. We join a group of forty councilors from around the world who serve as an advisory board for Slow Food. It is a three year volunteer position that has us traveling once a year to gather with our colleagues and discuss Slow Food’s work. Friday was formal in nature with a lineup of speakers such as Alma Rosa Garcés Medina, a biologist from Mexico and Tiejun Wen, the executive dean of China’s Institute for Advanced Studies of Sustainable Development at Renmin University and the Institute for Rural Reconstruction at Southwest University, talking of challenges that their countries faced from the effects of climate change. John Kariuki Mwangi, vice-president of the Slow Food Foundation for Biodiversity offered: ““In Kenya, my country, the pastoralist communities are the hardest hit and many are being forced to migrate…Slow Food is working on this…through the promotion of agroecology and the protection of biodiversity, standing alongside producers.” Fighting climate change is a new focus for Slow Food. The U.S. was represented when Kathryn Underwood spoke to the delegation about the history of urban farming in Detroit, the evolution of “slow neighborhoods” there and the contributions of African Americans and immigrants to both, highlighting the work of great Detroit organizations like D-Town Farm, American Indian Health and Security, Oakland Avenue Urban and Burnside Farms. We ended the night with a traditional hot pot dinner and many bottles of wine. Saturday delegates broke off into small groups to share success stories from our local efforts and grappled with questions pertaining to issues that Slow Food faces in promoting its message. It was an opportunity to get to know Slow Food leaders and their work better. Dinner was at the hotel and we were treated to performances such as the Chinese Dragon Dance (pictured), two young opera singers singing in Italian for Slow Food’s President, Carlo Petrini, and a calligraphy demonstration. Sunday concluded the conference with a half day of voting on statutes—for a full list click here—followed by a rooftop reception. It was overwhelming, exhausting, and exhilarating all at the same time. There are those delegates who found fault with Slow Food for “throwing a great party” but not getting much done. The vote on Congressional motions on the last day was more symbolic than an actual indication of delegate’s involvement as the focus had been decided by the executive committee prior to the conference. I think the format needs some work to incite more deep engagement with attendees, yet I also think it’s challenging to bring together five hundred people from around the world who have different languages, experiences, expectations and challenges in promoting Slow Food values to work on structural changes that need to be made or to complete projects that should be implemented over time. I think the actual work happens at home. Engagement with our international community does have its purposes. As Richard McCarthy, Director of Slow Food USA offers: “Slow Food gatherings are ends unto themselves. Spending time with inspiring leaders from around the world is a specific goal. It changes all of our perception of how our actions at home are aligned [globally]…and [we] learn from those who tackle challenging work on the other side of the planet.” Personally hearing of the challenges that fellow Slow Food leaders face encourages me to think beyond my own experience and to develop a broader view making my work here better. The Slow Food Great China chapter is the first of its kind in the country. It was founded recently in 2015 but has worked hard to nominate nearly two hundred items to the Ark of Taste; sixty have been officially boarded. We saw some of those items on display along with Ark products from around the world and tasted products that were on the Mongolian Autonomous Region’s Intangible Cultural Heritage List, some made by traditional processes that date back to the 13th century Yuan Dynasty. As we gathered in Chengdu, we brought a show of strength, support, and tourism dollars for traditional food ways and Slow Food efforts in China and gained inspiration from each other to continue the work back home. Do you ever find yourself wondering, what it might be like to be on the Slow Food Chicago Board? There just so happen to be some spots opening up - and if you've ever given it some thought, now is your chance to apply. Or, if you've never considered it, this profile will make you realize that you should. Like, yesterday. Megan Larmer is a former member of the Slow Food Chicago board and currently works for Slow Food USA in the big apple. She is a testament that your passion can indeed converge with your career - in big ways. If you've ever met Megan, you know she is a force - and her good vibes will inspire you to be, do, and live - better, just by being in the same room as her. We are fortunate enough that Megan gave us some time to dish on her experience on the Chicago board as well as how Good, Clean, Fair applies to way more than just food. Why did you join the Slow Food Chicago Board (i.e. how did you learn about it and what motivated you to get involved)? I was so moved by the generosity and encouragement I received from people on the Slow Food board - they supported the orchard project I was helping with by sending us to Italy for Terra Madre, hosted fundraising events and connected us with other experts for advice - that when they suggested I apply I was flattered and thrilled. I joined to be around these awesome people and to pay forward all I was lucky enough to receive. North American delegates (including Megan Larmer, center) in Italy. What project or initiative are you most proud of during your time with Slow Food Chicago? I'm proudest of the community canning classes that we led. The series of classes connected Slow Food with the general public, taught people about seasonality, and was a great way to build relationships with and support local farmers by buying the produce from them that may not have been sellable at market. Also, it was fun and delicious, like everything Slow Food Chicago does! I'm living in Brooklyn, working at the Slow Food national office. It's a great chance to see the real impact of our work on the global and national scale. Most of all it has impressed upon me even further how unique we are as a volunteer network that truly acts locally and thinks globally. Does Slow Food Still impact your work, life, eating habits? Um - yeah. So, I am lucky enough that Slow Food is both my passion and my job. My involvement with Slow Food has definitely transformed the way I eat for the better. Even more, it has given me friends in fields, markets, and restaurants all over the world. I travel often, and find the connections made during my time on the board in Chicago continue to guide me down exciting new paths across the globe. Good, Clean, Fair. What does this mean to you? This is the ideal that I seek to achieve in food, but also in life. It means that the ultimate goal of any dish or project is to bring together pleasure, sustainability, and justice. When all three elements are there, they heighten each other to become a whole greater than the sum of its parts. What advise would you give people who want to get more involved with Slow Food? Where can they start? It's easy! Follow along on social media, join a potluck, or book club. Pitch in at a crop mob or go to a dinner and ask other folks there about Slow Food. Face to face connection is the real strength of the Slow Food movement, and there's no better way to begin to learn about the vast and incredible work this global, grassroots network is doing. So, show up and start asking questions! Slow Food people almost always have the gift of gab, so don't be shy. Anything else you want to tell us that we may have missed? I miss you Chicago! Now, I obviously can't play favorites, but let me just say that the Slow Food Chicago chapter is pretty stellar and wherever I live, I always consider my own local chapter. Did Megan's profile make you hungry for more? Keep up with the movement at Slow Food USA via the below links. Turkey Day: Slow it Down! It’s that time of the year again! That time of year where we wake up at 5am to beat the lines for Black Friday deals, gather friends and family around the dinner table to eat antibiotic-filled turkey, and fall asleep in front of the TV watching football after Instagramming the dessert spread. Wait…what? No! This cannot be the modern Thanksgiving, right?! Unfortunately, the sad truth is with the rise of fast deals, fast food, and fast technology, we are moving further and further away from what should arguably one of the slowest holidays we have in America. Turkey is the centerpiece of the Thanksgiving dinner table, so let’s give it the love and attention it deserves. Let’s remember that this wonderful, nourishing bird on our table once had a life, and that it’s up to us to give it dignity in both life and death. Choose a bird that lived a great life on a local farm (find one here! ), and rest assured that your money went to supporting humane animal treatment, protection of the land, your wonderful farmer neighbor, and the health of your friends and family (money well spent, no?). Then roast that sucker to perfection. 2. Unplug, unwind, and enjoy your loved ones! 3. Drink a local libation! That’s right, Chicago, we have wonderful local distilleries who use local grains to make delicious liquor, and a farmers markets full of interesting ingredients (pumpkin, apples, pears, cranberries, etc.) that mix perfectly with cocktails. Impress your family and friends by making a signature cocktail drink of your own and support local farmers and small businesses while you’re at it! 4. Make your own side dishes! You know what’s slow? Sleeping in on Thanksgiving morning and making yourself a lovely cup of hot apple cider and enjoying being in your pajamas until company heads over. You know what’s not so slow? Elbowing three old ladies and tackling a couple of young men just to get $50 off the latest Game Boy. (We don’t even know if they make Game Boys anymore?) Sleep in! Sleep is slow and priceless! If you’re just itching to go shopping, though, think of skipping big box retailers and shop instead on Small Business Saturday. Taking place on 29 November, you can support local producers even after Thanksgiving is over. We hope this helps! How do you slow your Thanksgiving down? Slow Food Chicago envisions a world in which all people can eat food that is good for them, good for the people who grow it, and good for the planet. Sign up with your email address to receive our monthly newsletters.